My brother went on a trip to Germany for work and asked me to send him an email with different foods I thought he should try. I haven’t been to Germany unfortunately, but I’ve frequented German restaurants in the U.S. enough to give him some recommendations. Among those many recommendations was to seek out authentic German style soft pretzels (bretzel). Sure enough, after a few days of searching he found his pretzels and sent me a delicious looking photo. Meanwhile, back in the U.S., I had my own pretzel craving going on after sending him my German recommendations. On the same day that he found his pretzels, I decided to try baking my own at home. I knew the recipe wasn’t all that complicated – it’s really just some baked risen flour after all – but the technique for getting the pretzels to look and taste like pretzels is what I wasn’t sure about. 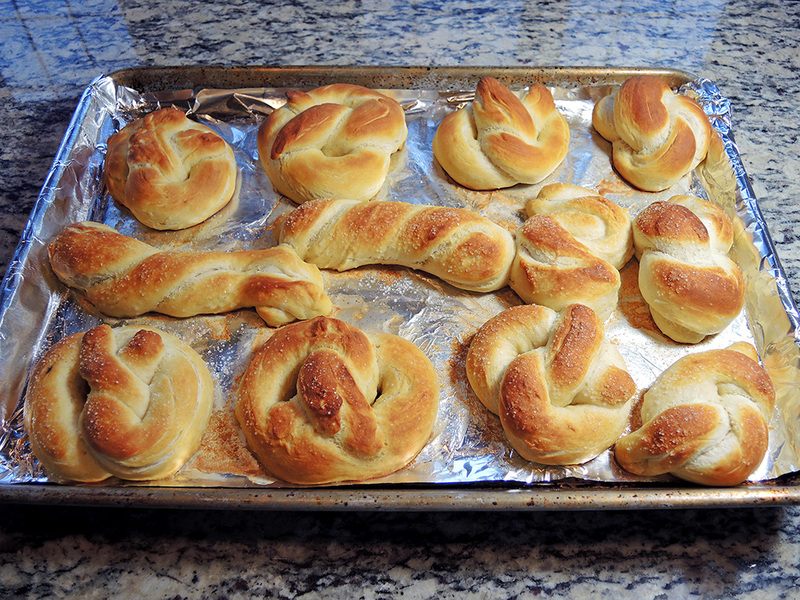 I did some research, which revealed that baking soda and water were a lay person’s secret to awesome homemade pretzels at home. 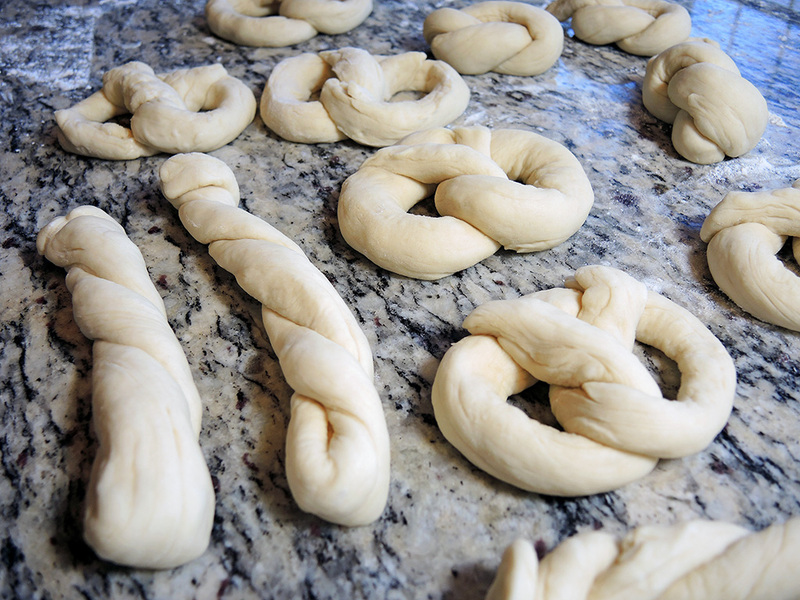 Classic recipes use lye (which is often caustic if you’re not careful) to get that perfect pretzel exterior, but the average person can easily obtain similar results using the much more mild baking soda. After making this recipe, I couldn’t believe how well they turned out! When my wife came home and opened the door, I heard her exclaim, “Hello? What’s that amazing smell?” Then when she saw the beautifully brown and golden freshly baked pretzel knots she immediately reached for one. We devoured far more than we should have the first time, but still managed to save some for later with some effort. We ate them with mustard and with a side of sweet cinnamon and vanilla glaze because they work so well as both a savory and sweet snack. 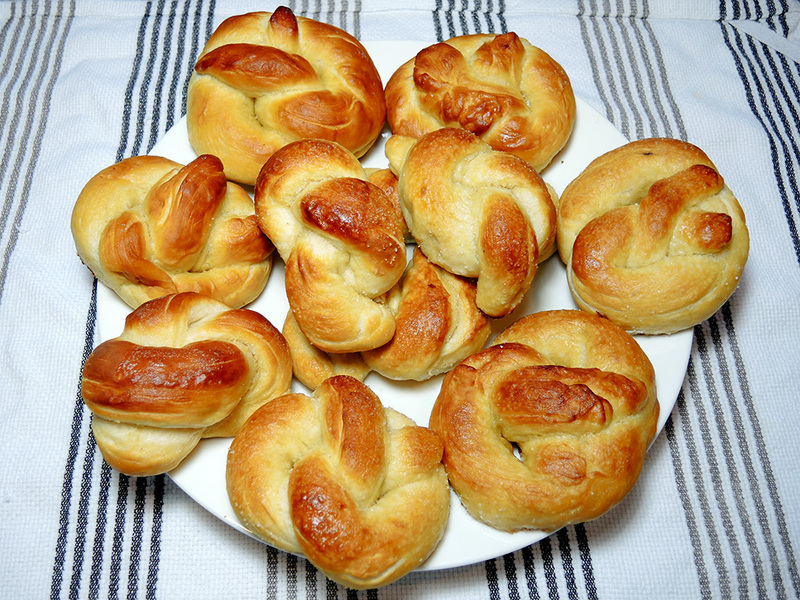 I can’t wait to have friends over just to offer them a dinner basket of soft baked buttery pretzels! Makes 12 servings at ~150 calories each. 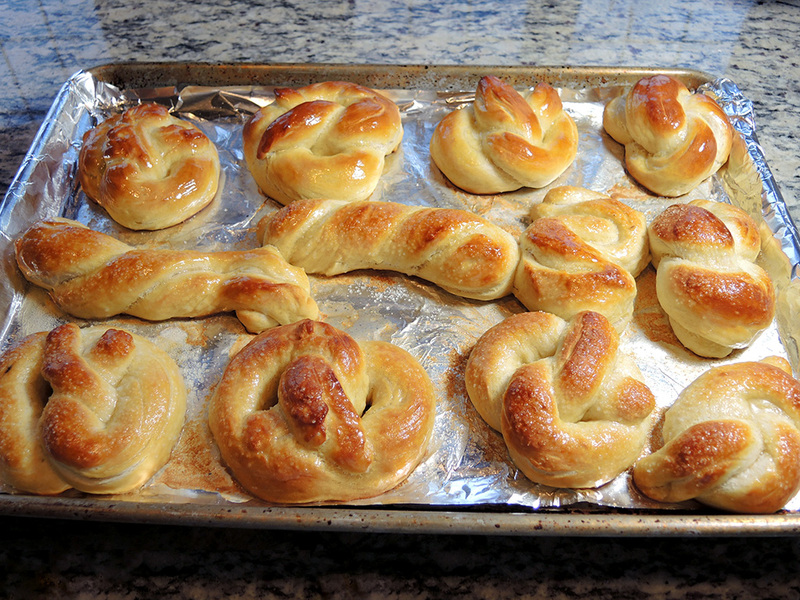 Braided and baked soft pretzels. 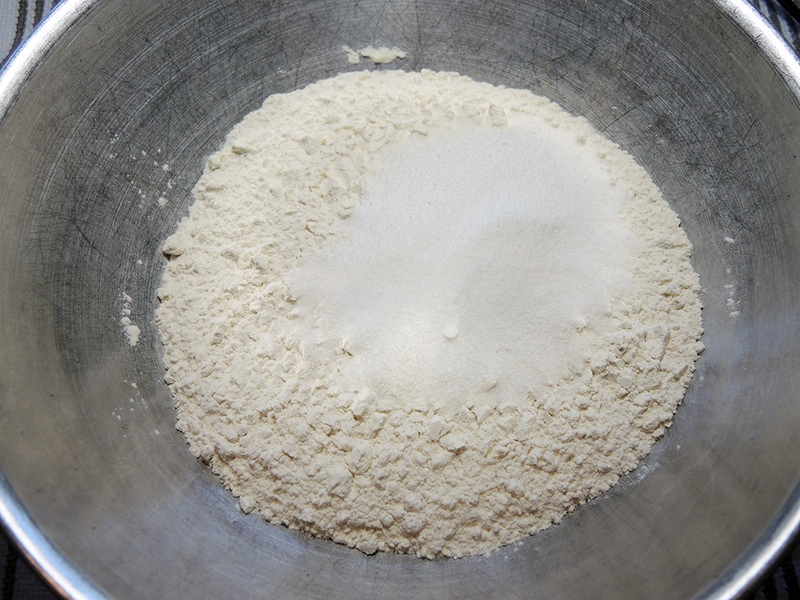 Combine the 3 cups of flour, 2 teaspoons of salt, and 1/4 cup of sugar in a large mixing bowl. Mix the dry ingredients well using a fork. 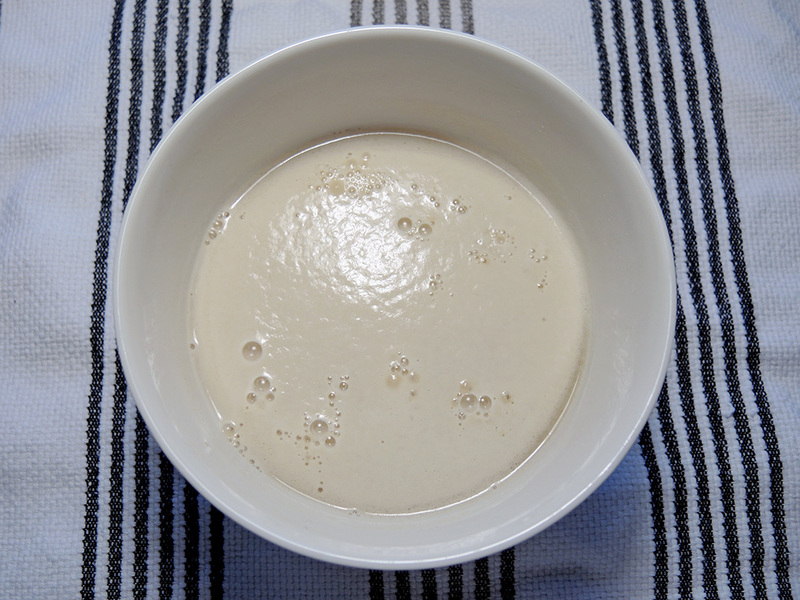 In a small bowl, mix the 1.25 cups of warm water with a teaspoon of sugar and the 4 teaspoons of yeast. Mix well until dissolved and let the mixture sit for about 10 minutes until it gets a little frothy. It may even smell a little bit like beer, which is good because yeast is one of the ingredients that gives beer a lot of its distinctive flavor and aroma. 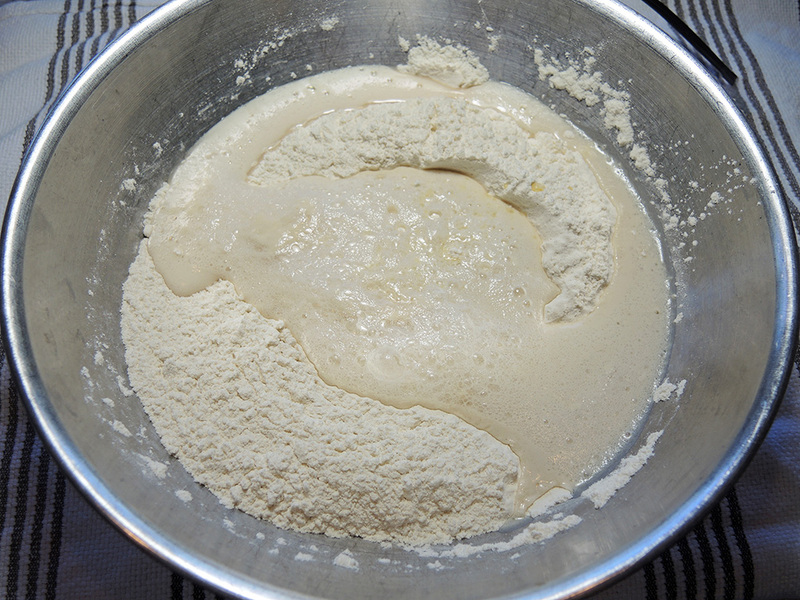 After 10 minutes, melt a tablespoon of butter in the microwave (or use vegetable oil) and add it to the flour mixture along with the yeast liquid. Mix the ingredients well starting with a rubber spatula. 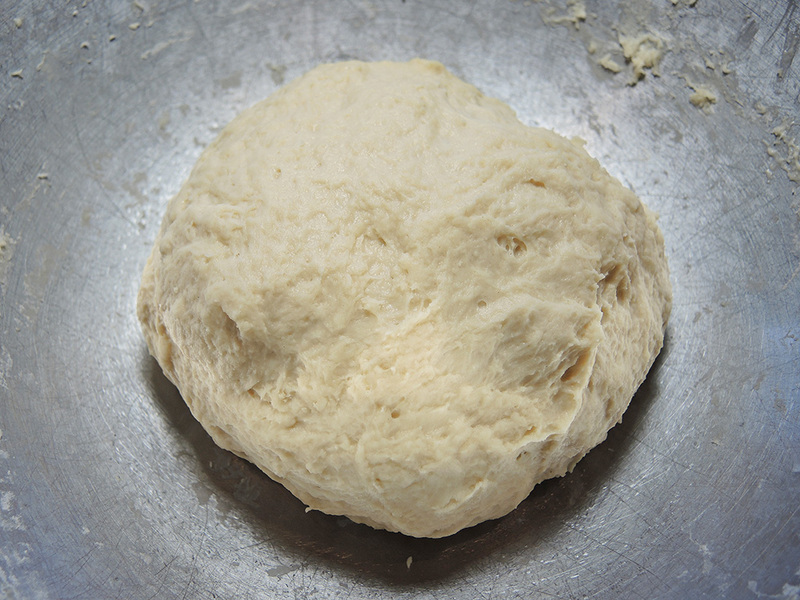 When the dough starts to form into a uniform paste, you can use your hands to knead the dough for 6 to 8 minutes until all of the ingredients are well incorporated and you can shape the dough into a ball. Don’t overdo it with the kneading though. The idea is just to get everything well mixed. 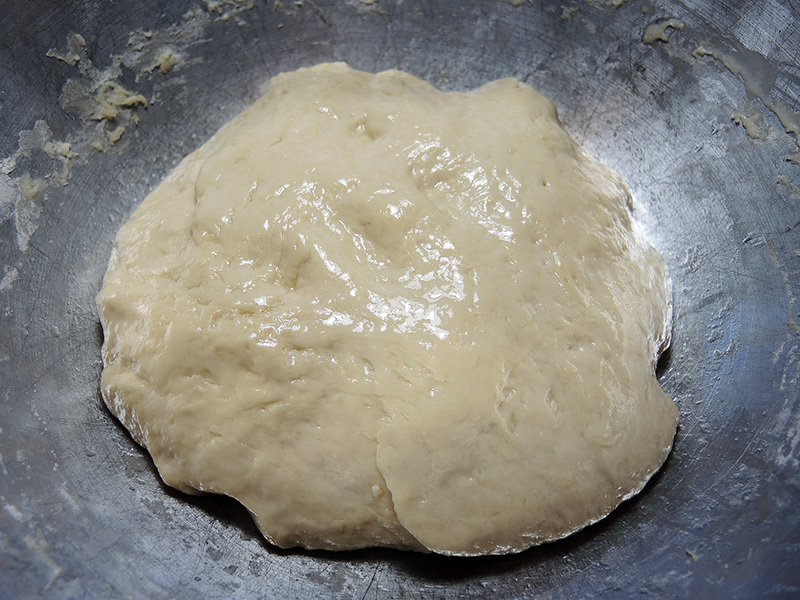 Next, use a teaspoon of vegetable oil to grease the outside of the entire dough ball to keep it from sticking to the bowl as it rises. 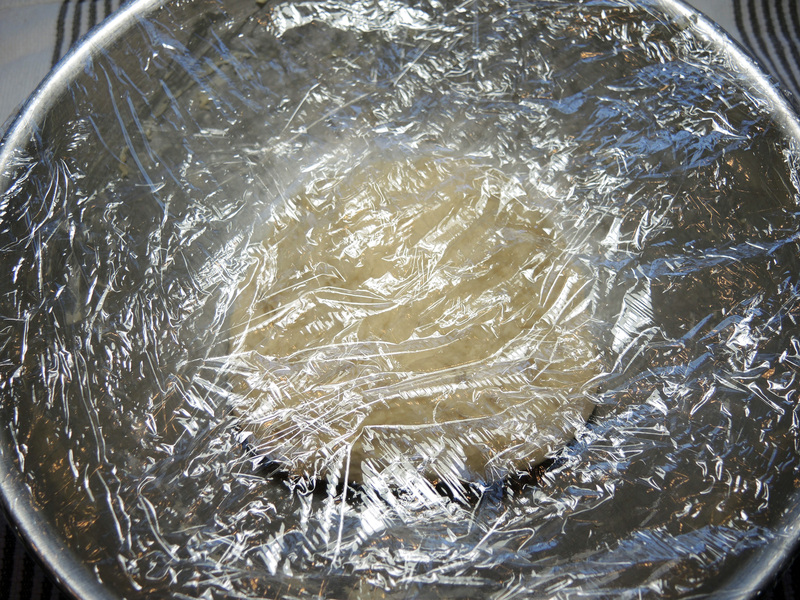 Cover the dough with plastic wrap or a towel and let it rise for 1 hour at room temperature (don’t refrigerate!). 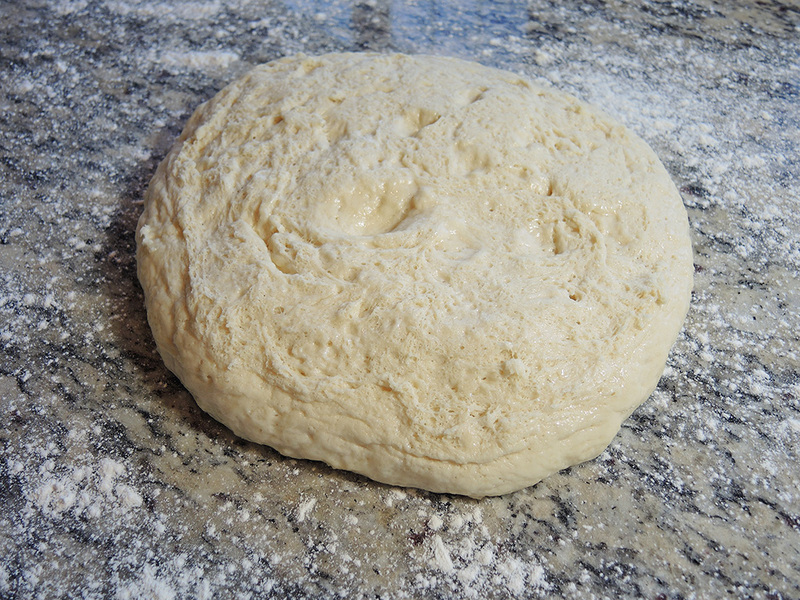 After an hour, the dough will have risen noticeably and be very soft to the touch. You’ll also start to smell that wonderful yeast and dough combination that is a precursor to baked breads. 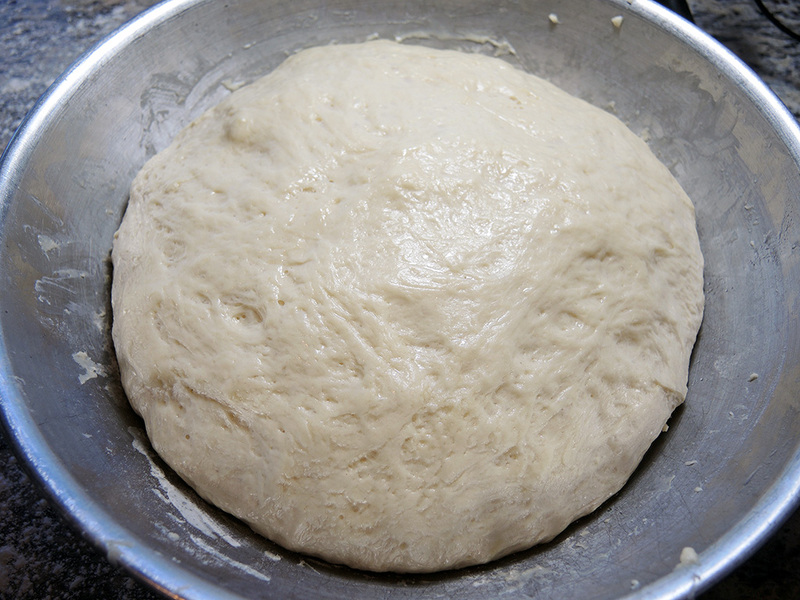 At this point, start to pre-heat your oven to 450 degrees F.
Dust a flat, clean surface like a counter-top with some flour and carefully get the dough ball out of the bowl and onto the counter. Dust the top of the dough with a little more flour to help keep it from sticking. Dust your hands with flour and cut the dough in half. 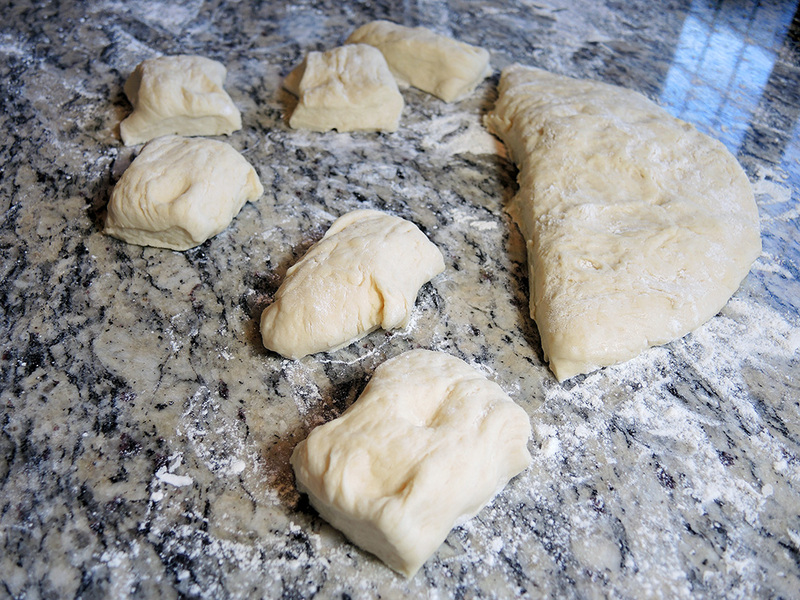 Start stretching and forming half the dough into an elongated rectangle that you can then cut into 6 equal pieces. When you have a nice stretched rectangle, cut the dough into six pieces and repeat this process for the other half of the dough. You should end up with 12, evenly sized pieces of dough. Now it’s time to create some fun shapes! 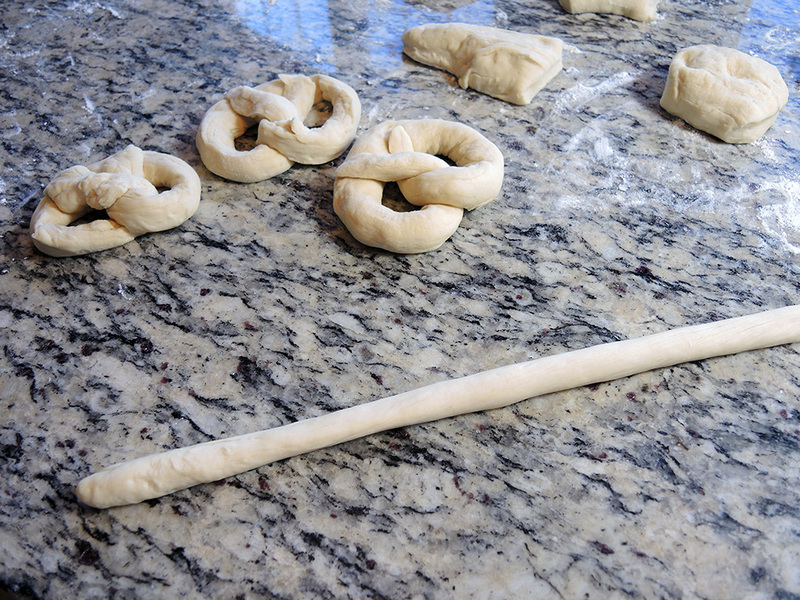 Roll out a piece of dough into a long, thin cord. The length is really up to you depending on what kind of shapes you want to make. The typical bowed pretzel shape is always fun and you’ll need a decently long cord for that. I found that the usual pretzel shape is great, but I also really liked just rolling out a cord of dough and tying it in a single knot (like the first knot in a square or granny knot for anyone that knows their knots). I don’t recommend the long twisty style you might see in my pictures. Those looked fun, but didn’t give the best results. Repeat this process for all of the pieces of dough. Mix and match the shapes as you like! When done with the braiding, get 4 cups of hot water and 1/2 a cup of baking soda ready to use. If your hot tap water isn’t clean or isn’t hot enough just heat some cold water and let it cool slightly so that it is hot, but not boiling. 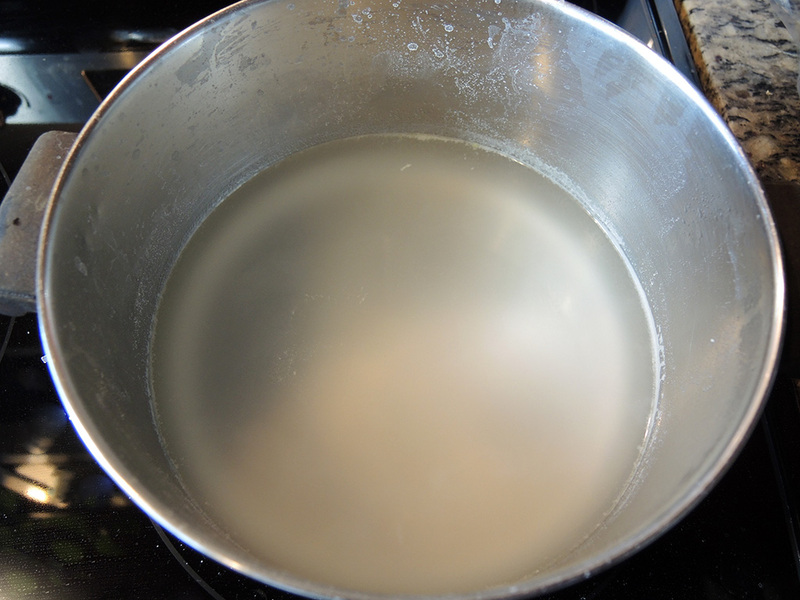 Some light steam is ok. Then add in the baking soda and mix until well dissolved. This step is especially important because this alkaline mixture of baking soda and water is what will help to give the pretzels that deep brown color on the outside as well as that nice outer texture that is so characteristic of soft pretzels. It works because the alkaline mixture speeds up the browning process as the pretzels cook. Historically, the original method actually used lye, which is a highly alkaline substance (an ingredient found in soap as well) instead of baking soda. However, since it can be hard to work with and can cause chemical burns (like in that iconic scene of the movie, Fight Club!) many people just use baking soda. Line a baking sheet with aluminum foil (2 baking sheets if your pretzels won’t all fit on one sheet). Keep in mind that the pretzels will expand a bit as they bake. Also make sure to grease the foil very well using butter or vegetable oil. This will help to keep the pretzels from sticking when they bake. Using a slotted spatula or large slotted spoon, carefully scoop up a pretzel and place it into the hot baking soda mixture. Let it sit for 15 seconds or so as you splash some of the water over the top using the spatula or spoon. Then take it out of the water, let it drain a bit, and place it on the baking sheet. Repeat this process for all of the pretzels. Sprinkle the pretzels with pretzel salt, kosher salt, or coarse sea salt. Don’t go overboard with the salt, but just make sure to lightly cover the tops. 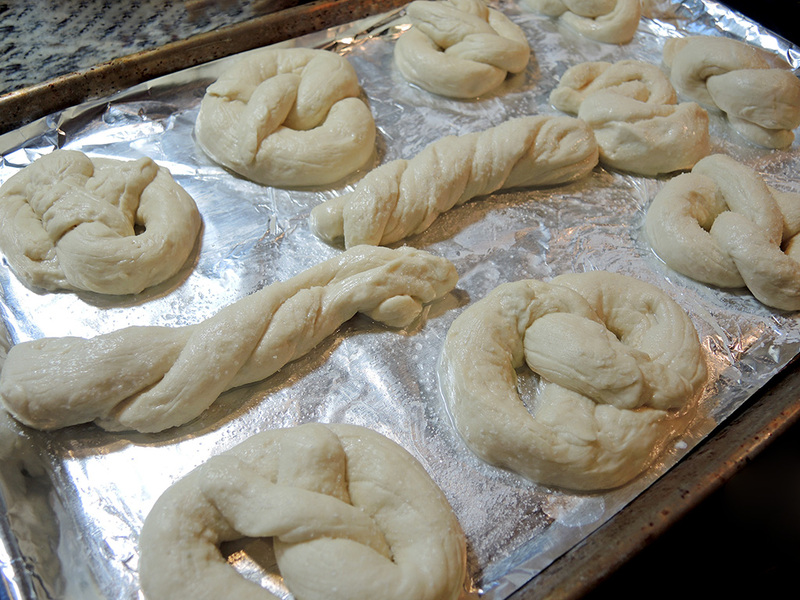 Slide the baking sheet(s) into the oven and make the pretzels for 10 minutes or until they are a nice deep brown. Not all areas of the pretzel will get that deep brown, so just pull them out as soon as the outermost edges are that classic pretzel color. 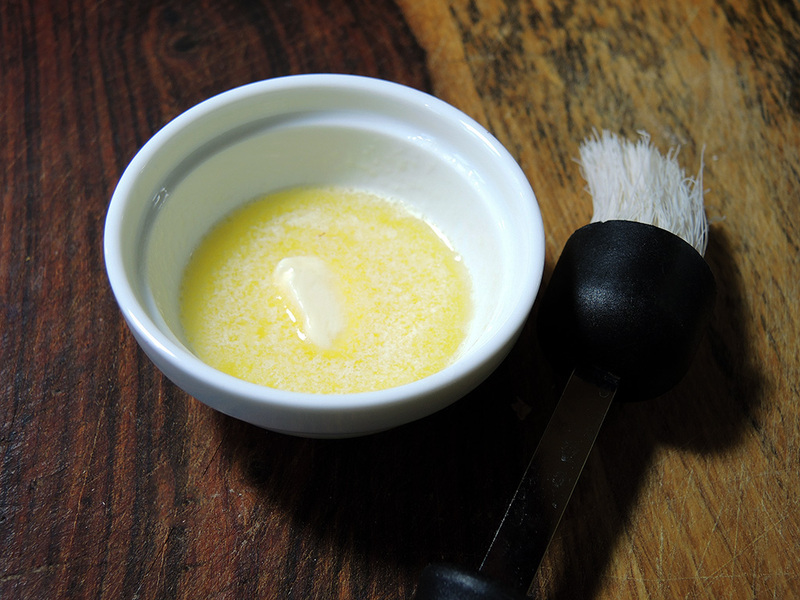 Melt 2 tablespoons of butter in the microwave to brush butter onto the pretzels. Brush each pretzel with a nice amount of butter to coat the entire top. Then throw them in the oven for another 1 to 2 minutes. You’ll end up with some rich, buttery, glistening pretzels. Serve them immediately or, better yet, let them cool. I discovered that the pretzel flavor actually depends as these pretzels cool. They taste great piping hot, but they taste even more like traditional pretzels when they cool down. Eat them with your favorite mustard for a savory treat or eat them like a dessert dipped in a sweet vanilla glaze! These pretzels work as a salty or sweet treat. They’re also just wonderful plain or buttered. If you have leftover pretzels, place them in a sealed plastic zipper bag and refrigerate. 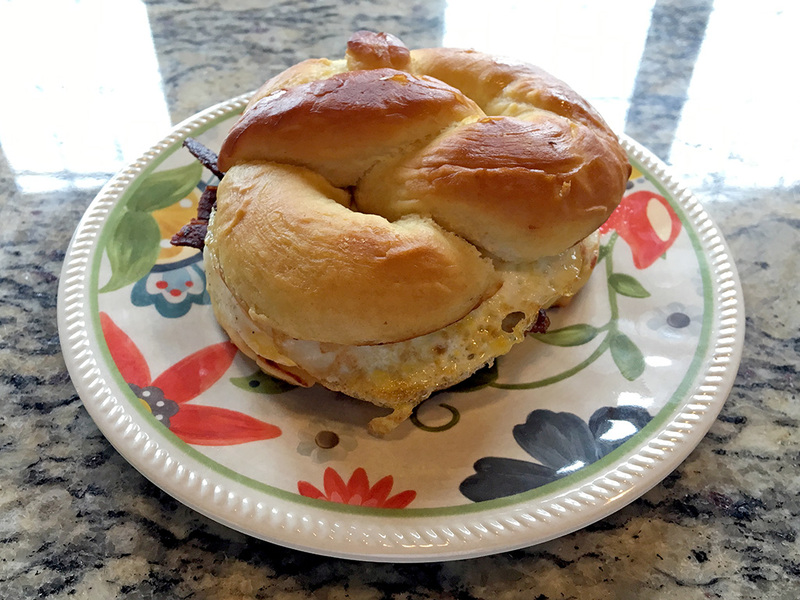 Use them the next morning to make pretzel breakfast sandwiches! Thanks, Jess! I know the feeling when something just doesn’t turn out. Luckily, this recipe worked from the start. That doesn’t always happen, of course. Happy pretzel making!